US rider Lance Armstrong’s seven Tour de France titles will not be awarded to anyone else, the International Cycling Union has announced. 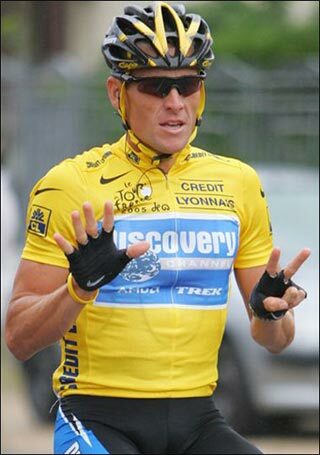 Lance Armstrong was stripped of his yellow jerseys by cycling’s governing body for doping on Monday. “The management committee decided not to award victories to any other rider or upgrade other placings in any of the affected events,” said a UCI statement. Lance Armstrong crossed the line first every year between 1999 and 2005. The UCI has also ordered Lance Armstrong to pay back all his prize money from this period. The statement added: “The committee decided to apply this ruling from now on to any competitive sporting results disqualified due to doping for the period from 1998 to 2005, without prejudice to the statute of limitation. On Monday, the UCI ratified the decision of the US Anti-Doping Agency (USADA) to strip Lance Armstrong of his seven Tour titles. The UCI’s statement went on to add that there was “little honour to be gained” from reallocating the yellow jerseys from 1999 to 2005 to any other riders. A USADA report called the American a “serial” cheat who led “the most sophisticated, professionalised and successful doping programme that sport has ever seen”. Lance Armstrong has kept quiet since USADA’s report was published earlier this month.